A Kingston-based seniors group is getting a helping hand from the Anglican Church of Canada to launch a bursary program for children orphaned by a church bombing in northern Pakistan. On Sept. 22, 2013, a twin suicide-bomb attack killed 127 people and injured more than 250 at All Saints Church in Peshawar, Pakistan. The attack also orphaned 41 children. It was the deadliest attack against the Pakistani Christian minority in the country’s history, according to the Associated Press. As the two-year anniversary of the attack approaches, the Christian Cultural Association of South Asians, a Canadian seniors organization headquartered in Kingston, is hoping to deliver bursaries to four to five students and fund an education that might not otherwise happen. 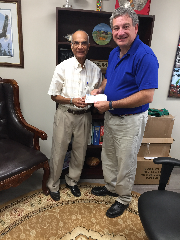 The fund, called Pakistani Youth Education, or PYE, received a $10,000 donation from Bishop Michael Oulton on behalf of the Anglican Diocese of Ontario to set up the education fund. “For us in the Diocese of Ontario to be able to partner with the CCASA, to be able to partner with our sister church in Pakistan, to be able to reach out and make that difference, I think it’s an amazing opportunity and I’m just thrilled we can be a part of it,” Oulton said. He added that he and the church were happy to support a “positive effort to alleviate the horror that’s being experienced in the area.” Inspired by stories of Muslims in the community forming a human chain around the church the Sunday after the attack, the bishop said it was important to promote interfaith learning and communication. Before the attack, Sam Laldin, the CCASA’s chairman and chief executive officer, said the church was a historic and beautiful building, serving as a safe haven and central gathering place for the community. After the devastation, Laldin said, his organization knew something had to be done, not only because many of people in it are South Asian — the region that includes Pakistan — but because it was an opportunity to make a difference. The seniors group had raised money for various causes before, but this was one of its more ambitious undertakings, and Laldin said he didn’t have any prior experience putting together a bursary fund. Originally, the goal was to raise $7,000, but Oulton offered $10,000. “That was really encouraging and I thought, ‘gee, I must be doing something right,’” Laldin said. Not only did Oulton offer the sizeable donation, but also offered to house the entire fund in the Anglican Church’s Consolidated Investment Fund so it could produce more interest and increase the number of bursaries in the future. Laldin now hopes to elicit donations from the wider community. Already an aid group in the U.K. offered to donate 500 pounds ($925) to the education fund. Persecution of religious minorities around the world, including Christians, is an issue close to Oulton’s heart. He said he hopes to “wash away” the feelings of hopelessness and despair caused by division and violence in the area. “Opportunities like this allow us, as Christians, to be a reconciling force in the world rather than a force of division,” he said.